The real title of this recipe is Macaroni & Cheese (A Few Ways) but I only made one so…full disclosure. Here’s a funny thing: I have never, ever, in my life had Kraft Macaroni and Cheese. I don’t know how that could be since I ate every other kind of processed convenience food as a kid and I’m pretty sure I went to college. When I was in elementary school I was especially fond of a product called “I Hate Peas” that was essentially frozen french fries with some kind of ersatz pea nutrition infused into them (I believe they had broccoli and carrot versions too.) It’s products like these that supports a theory I’m developing that the 70s was truly the nadir of our American culinary history. The product was a flop, by the way, and I demonstrated my grief by not eating another vegetable for 20 years. Because I didn’t cut my teeth on the Kraft stuff I feel like my baseline for mac & cheese has always been a bit higher than the norm. 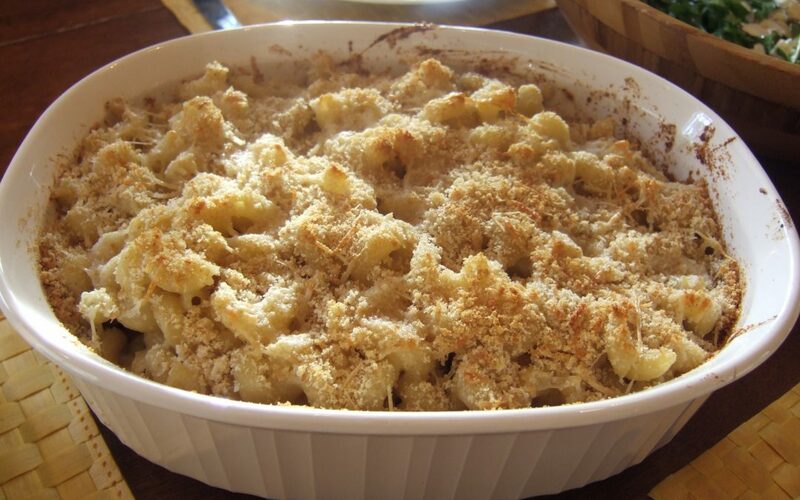 Gwyneth presents a very competitive mac & cheese recipe which is a good deal easier than many I’ve made. It’s got all the required elements including the all-important breadcrumbs, and the sauce that holds it all together is very simple. I loved the creamy subtlety that the marscapone brings to this recipe. You can find the recipe here, along with the variations. I think the one with tomato sauce sounds very yummy. Thanks for posting this recipe. I tried it this evening as a side dish for a roasted chicken I made for dinner. I must say, it wasn’t very creamy like I wanted it to be. I personally felt that 16 oz. of macaroni was just too much. I do really enjoy your posts, though. Keep up the great work. Yes, it is not as traditionally creamy as most mac & cheese dishes, I should have mentioned that. I like it this way but it is a surprise if you’re not expecting it.